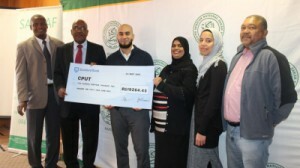 A generous donation of almost R520 000 from the South African National Zakáh Fund (Sanzaf) is enabling 59 students to pursue their studies at CPUT. During a cheque handover at the Bellville Campus [on Monday], SANZAF’s Sarfaraaz Hamza explained that the donation was made possible thanks to many donations called Zakáh and Sadaqát from the Muslim community in South Africa. Each year Sanzaf collects millions of rands in donations and approximately 30% of that is spent on education bursaries. “We have many graduates and staff members who have studied at CPUT and we are honoured to have been part of the institution and be able to contribute in this way,” says Hamza. Vice-Chancellor Dr Prins Nevhutalu accepted the cheque saying the donation was extra special because it came straight from the heart of people. “Many of our students cannot afford to pay and I accept this gratefully with both hands because you are making a big contribution to the sustainability of the institution,” he says.